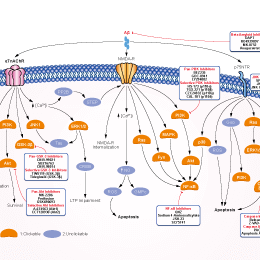 DAPT (GSI-IX) is a novel γ-secretase inhibitor, which inhibits Aβ production with IC50 of 20 nM in HEK 293 cells. RO4929097 is a γ secretase inhibitor with IC50 of 4 nM in a cell-free assay, inhibiting cellular processing of Aβ40 and Notch with EC50 of 14 nM and 5 nM, respectively. Phase 2. (d,e) Effect of TUG1 overexpression on Nestin activity. Plasmid vectors expressing indicated genes were added to GSC-pE-Nes-222 treated with RO4929097. Phase-contrast and Nestin-EGFP images were shown in (d). Scale bars, 100 μm. (e) Intensity of Nestin-EGFP (left) and number of viable cells (right) compared with the DMSO control were quantified. Viable cells were assessed by trypan blue staining. *P<0.01, Kruskal–Wallis analysis. For all the experimental data, error bars indicate +s.d. (n=3). MK-0752 is a moderately potent γ-secretase inhibitor, which reduces Aβ40 production with IC50 of 5 nM. Phase 1/2. Jurkat cells were treated with (D) TRAIL (20 ng/ml), MK-0752 (50 µM) or a combination of the two for 48 h. Vehicle control for (D), 0.1% (v/v) dimethyl sulfoxide. Data shown are the mean ± standard error of the mean of ≥3 independent experiments. *P≤0.05, **P≤0.01. TRAIL, tumour necrosis factor-related apoptosis-inducing ligand. Avagacestat (BMS-708163) is a potent, selective, orally bioavailable γ-secretase inhibitor of Aβ40 and Aβ42 with IC50 of 0.3 nM and 0.27 nM, demonstrating a 193-fold selectivity against Notch. Phase 2. A panel of GICs lines was treated with various concentrations of γ secretase inhibitors BMS-708163. Cells were treated with increasing concentrations of γ secretase inhibitors in triplicate wells for 72 hours, and cell viability was assessed by CellTiter-Blue assay as described in Materials and Methods. The results shown are of a single experiment with three independent replicates cell viability was measured by CellTiter-Blue assay. The graph depicts cell viability at 72 hours. Cell viability in the vehicle control was considered as to be 100%. LY2811376 is the first orally available non-peptidic β-secretase(BACE1) inhibitor with IC50 of 239 nM-249 nM, that act to decrease Aβ secretion with EC50 of 300 nM, demonstrated to have 10-fold selectivity towards BACE1 over BACE2, and more than 50-fold inhibition over other aspartic proteases including cathepsin D, pepsin, or renin. Phase 1. Tenuifolin, a secondary saponin isolated from hydrolysates of polygalasaponins, inhibits beta-amyloid synthesis in vitro and has nootropic activity in vivo via acetylcholine esterase inhibition and increases norepinephrine and dopamine production. EUK 134, a synthetic superoxide dismutase (SOD)/catalase mimetic, exhibits potent antioxidant activities, and inhibits the formation of β-amyloid and related amyloid fibril. HP-β-cyclodextrin (HP-β-CD), a well-known sugar used in drug delivery, genetic vector, environmental protection and treatment of Niemann-Pick disease type C1 (NPC1), is an inhibitor of amyloid-β aggregation. Tabersonine, an ingredient extracted from the bean of Voacanga africana, is a potent inhibitor against Aβ(1−42) aggregation and toxicity.